OK, so you might want to brace yourself. I'm going to give you a nice little cooking tip that is possibly going to rock your entire world as you know it (that is, if you have not already heard of it). I discovered a little short cut in my day to day cooking that has turned into a real time saver, and even more importantly, an eye, nose and stinky house saver. It seems to me that most recipes start with a bit of butter, some minced garlic, and... wait for it... chopped onions. Onions give great flavor to everything. Chopped, diced, sauteed, fried, simmered, stewed. I even like them "bloomin". They are the "Baking Soda" of the vegetable world. Only down side to these little babies are the eye watering fumes (nerdy term here would be propanethiol S-oxide) that waft up from your chopping board and scorch your retinas . I've tried a bunch of online tips and techniques to get ride of those pesky vapors. Opened windows, burned a candle close by, and even donned on sunglasses at night to avoid tearing up. Recently I have found a way to now end all that... so without further ado, I'd like to introduce you to my little friend: Frozen chopped onions. I picked up a couple of these babies and keep them at the ready in the nearby freezer. 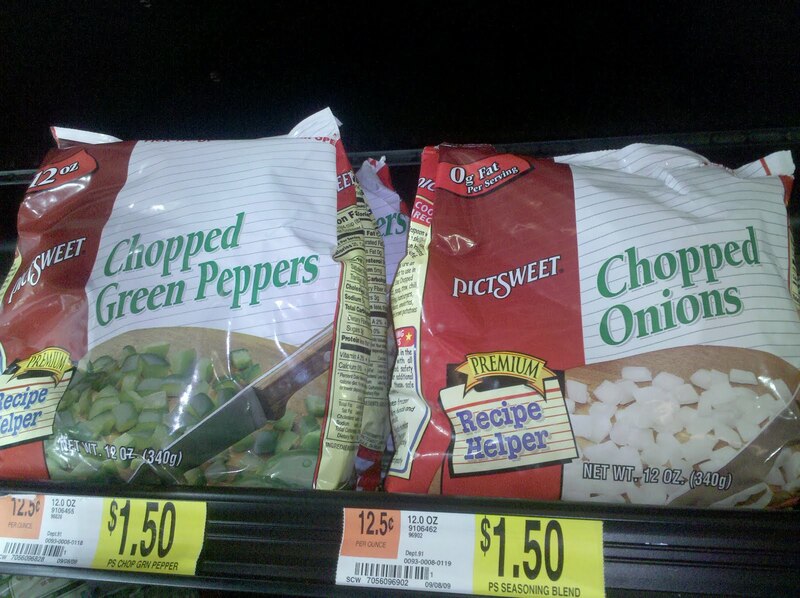 One 12 oz bag is usually good for two different meals, so if you do the math, that puts them at the SAME price as a regular onion you would have to chop yourself. These are great for soups, stews, sauces, ground meat, stir-fry, anywhere you would put fresh chopped onions. Just dump them in frozen (I like to smack the sealed bag around on the counter - to break up the onions AND release any pent up aggression at the same time) then dump into your waiting pan. I must say they are exceedingly handy in the morning if you are throwing a recipe in the crock pot. There is just something about the smell of meat or onions at the crack of dawn that turns my stomach a bit. It is so NICE to just measure what you need and go on about your day. In case any of you are wondering, I have not turned my back on regular onions. I use them just as much as these newfangled ones. But I AM enjoying the option of using these whenever the mood strikes, so I try to keep a few bags lurking in the freezer for just the right time. It seems lately when I use them, I feel like shouting from the rooftops Look MA... no TEARS!! Hallelujah.